Today during the Saturday Session (Nov 11, 2017), I demonstrated this effect but I think the quality of my video camera is not that good and the effect could not be really appreciated. I recorded this demonstration so you can see it better. I call it "Another Vanishing Coins in Box." It is not the final version of the effect. I think I want to incorporate the move into a larger routine and do it just once. Very nice. Thanks, I enjoyed it. That was wonderful! I enjoyed every bit of it. I'm a novice coin worker. What kind of box are you using? Thanks! It is just another coin box that not a lot of people know about or use. But with it you can do very nice effects. It is a box that can be an Okito box, a Boston box and/or a combination of those. Got it! Thanks. Do you know if I can possibly get one of these for Morgan sized coins? I did some searching, but didn't find anything. I think they don't make them anymore. Whatever is in stock is what is available and I know they made them for half dollars or smaller coins (I have a smaller one). I seem to remember that is what the instruction sheet said. I also think they were made in India. Very nice! I like that a lot. Here is a comparison between the two boxes I own. As you can see they look very similar but the one on the right is a little smaller and a half dollar does not fit inside. I had to adapt the effect to local coins. I haven't seen larger boxes for Dollars so I wouldn't know if they make them. But these pictures demonstrate that they made them in at least two different sizes. Thanks for the reply Luigimar! Very nice - have never seen this before. Makes me want to post a video of my coin flite routine. FYI - as a retired machinist, if there are effects or ideas anyone would like custom made, please feel free to drop me a note. 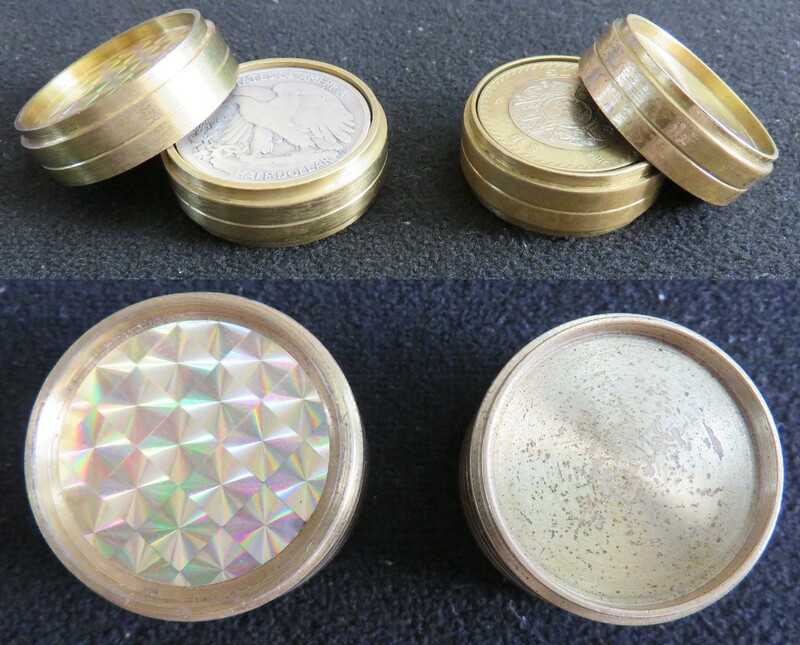 Made of hexagonal brass to hold 4 quarters with hole thru the center. Comes with a small bag - coins travel from the bag to under a cup.